Using a predetermined set of roles, events, artifacts and rules is like having a GPS that just gives you the directions without the map. If you get lost or you can’t make a turn or you miss it you are lost. Being given a map with alternatives to get there provides not only options that work for you but provide a way of getting back on track when you get lost. In the complex world of software development it is even more likely you’ll need this ability. Many people require a given set path. But have it include where you are and have it provide you with a reset option when you get lost. This is what Lean-based team Agile does. Scrum doesn’t even try because you are out of Scrum by this time. Scrum proponents just call this Scrumbut and go on to the next team. 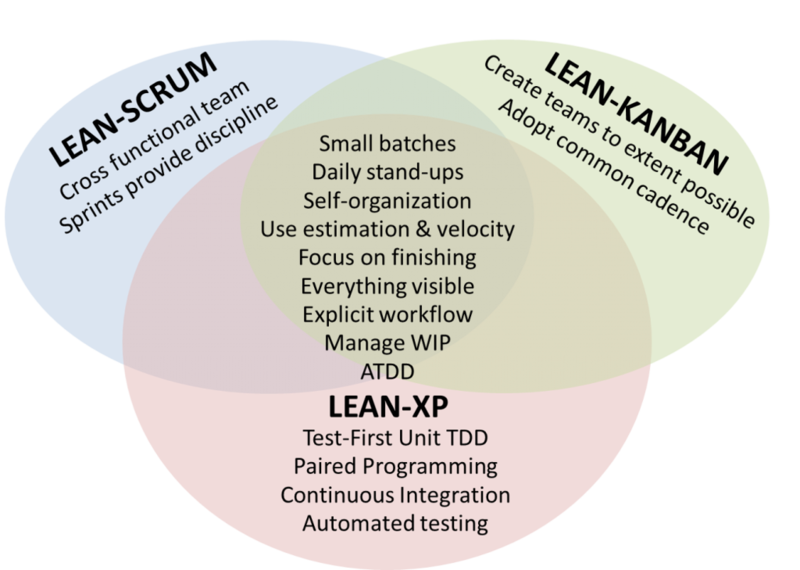 This doesn’t mean you can’t use Scrum, it just means that when you do Scrum you should do it within the context of Lean. Looking at differences between Scrum and Kanban can help us see which will work better for us. 1) Scrum requires planning the sprint ahead. You can plan in Kanban but it’s not necessary and normally isn’t done. 2) Scrum requires cross-functional teams, a good thing to have. Kanban doesn’t but this often misses the opportunity for team structure improvement. 3) Scrum requires starting with its roles, practices, events & artifacts. Kanban allows you to start where you are & provides a transition model for improvement. 4) Scrum improves by removing impediments. Kanban improves by focusing on shortening cycle time. Teams that don’t like to be told what to do may resist Scrum. Kanban requires more discipline from the team than Scrum. Note that executives can better relate to Kanban’s focus on flow. Combined with its insistence on visibility, executives can better understand the importance of managing workload. In few cases is one clearly superior to the other. Taking a blend of the two often makes sense. Doing this is not difficult. Given I’ve written 5 books, delivered 100s of courses/talks/ webinars, influenced Scrum, Kanban & SAFe, that’s a big statement. I think it’s true because I hope its introduction of proven methods of training/coaching developed at Harvard will prompt the Agile industry to improve current methods which I believe are outdated and one of the biggest impediments to the widespread adoption of effective Agile. • Content. Being effective requires both Scrum and Kanban. Each are selective views of Lean, which is now recognized as a critical component of Agile beyond a team. You can learn more about this course here. Take the overview box (mostly black) for a 28 minute overview of the class that explains both content and format. A development team working in harmony is a beautiful thing. Every two weeks they get together to decide what they are going to do over the next sprint, and then they proceed to do it. Daily retros keep them on track. Guided by a product owner the team incrementally builds their product increment. A demonstration at the end of the sprint produces value and important feedback to make sure they are going in the right direction. They get better each week with retros. Magic. Getting to this may be a challenge, however. Well formed teams may not exist and it may be unclear how to make them happen when some people are needed by many teams. Also, the culture of an organization may be such that reorganization is not an easy move. Another type of magic is possible, however. That’s when people make agreements to get any started work completed as soon as possible and not to start work if it will slow down more important work. They make all of their work visible to each other so they can work as a team even if they aren’t dedicated to it. They continuously improve with small changes. Also magic. 6) management tells the teams to do Scrum, because Kanban doesn’t work. The solution is to teach Scrum, when it’s used for software development, with what is necessary to do software development. The fact that Scrum can work anywhere works against you if you get generic Scrum training instead of Scrum training designed for you. Although Scrum proponents hail Scrum as a good way to figure this out there are other, faster methods available (mostly just look at your current situation and see where your blockages and large queues are – see Value Stream Impedance Scorecard for more). Clearly Scrum & Kanban both attempt to address this in their own way and it should be clear how each one addresses these. Your choice though is to learn a framework or method that helps you with these challenges or in your initial training work on them directly – and then adopt a Scrum/Kanban approach that best fits your situation.